As Machu Picchu continues to be overrun with visitors and recent changes in regulations further limit your visits, the remote ancient fortress of Kuelap offers an exciting and off-the-beaten-path adventure for travelers interested in mysterious ancient cultures and spectacular landscapes. The remoteness is an advantage, and a disadvantage. This isolation is what has kept many visitors away. Until recently the only way to reach the site was a long (but sensational) bus or car ride to the town of Chachapoyas and from there a 2½-hour drive to the fortress. 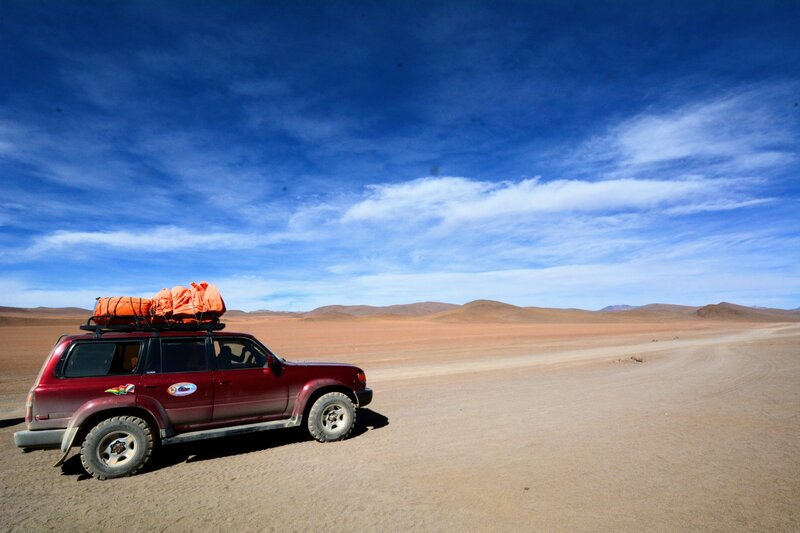 But the remoteness is a drawback for travelers with limited travel time or an aversion to long and arduous travel. Archaeologists are still digging there. You can stay as long as you want. No permit necessary (for now). The pre-Inca and Inca ruins is an ancient walled fortress and archaeological site located in the Amazonas Region of northeast Peru. It sits high on a limestone escarpment at 9,800 feet above sea level overlooking the Utcubamba Valley. 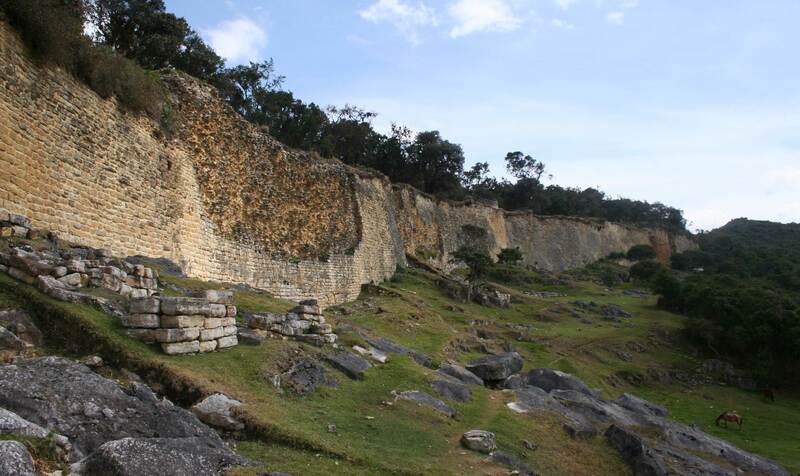 Construction of the fortress by the Chachapoyan people began in the 6th century AD. The walled city stretches almost 2000 feet but is only 360 feet at the widest point. You don’t actually walk through Kuelap but on top of it. The massive walls surrounding the city are 30 to 60 feet high with finely carved masonry of limestone blocks (some weighing up to 3 tons). The outer walls are dramatic but what makes a visit to Kuelap so special is walking in the shadow of a lost civilization that is somewhat a mystery to this day. Much of the site is overgrown by trees, bromeliads, orchids and mosses. The site is home to many birds. You enter the site through one of three narrow entrances. 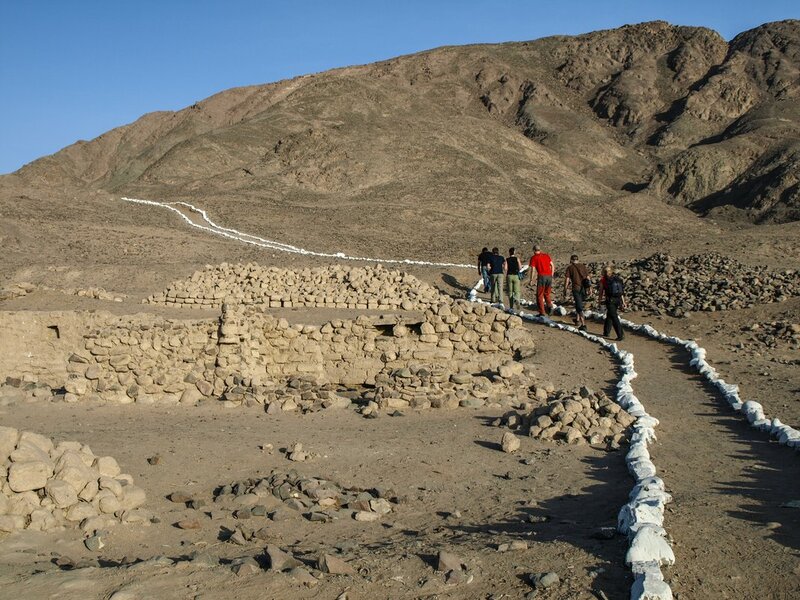 There are over 550 structures in the site, all but 5 are circular and typical of pre-Inca design. The majority of structures were built between 900 and 1100 AD. Castillo is a religious platform overlooking one entrance. 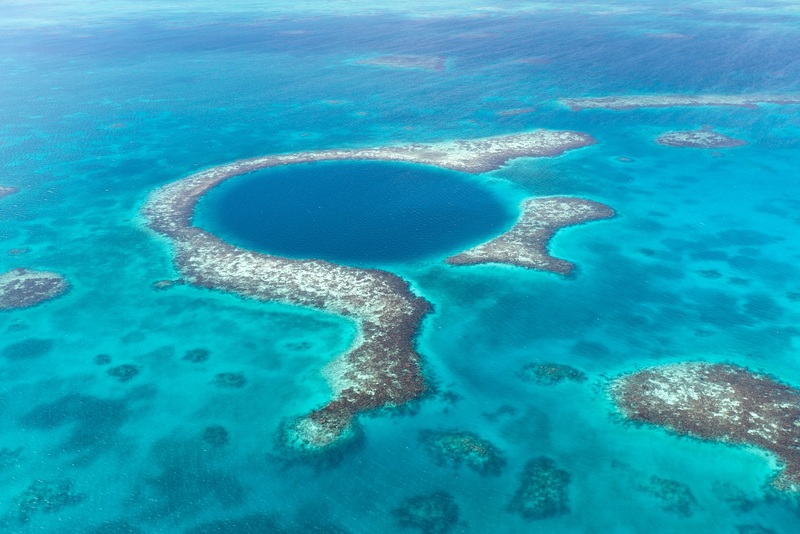 The remarkable El Tintero appears as an inverted cone and is believed to have been a solar observatory. The area known as Pueblo Alto has a wall over 37 feet high and is accessed by 2 narrow entrances. Torreón is a 24-foot tower-like structure that may have been used for defensive purposes. 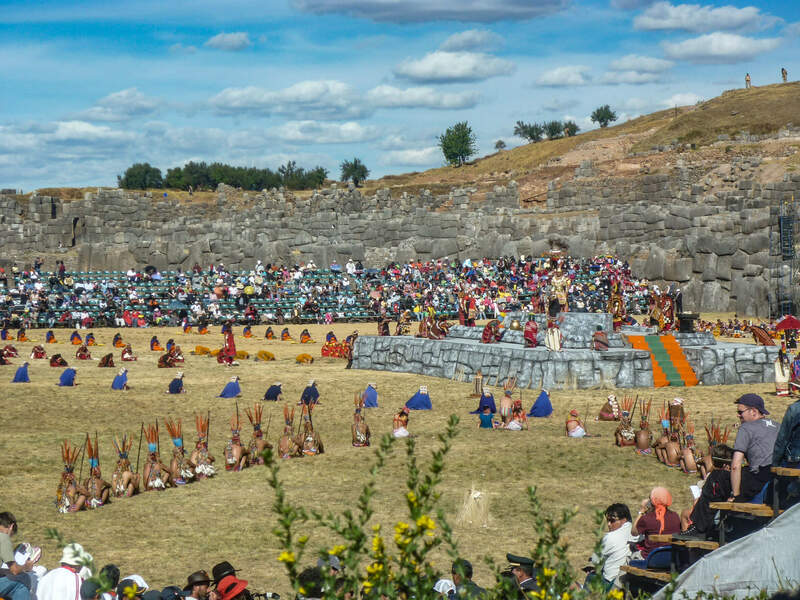 Around the site, you will find stones with anthropomorphic, zoomorphic and geometric designs. Some walls have rhomboid and zig-zag shaped friezes. Burials have been found inside the circular structures as well as in the walls. Stone canals are believed to have supplied water to the city from a spring at the top of the mountain. The Chachapoyan were conquered by the Inca Empire sometime in the second half of the 15th century. After the civilization was defeated the Inca built additional structures at the site. Expert guides will point out the different styles. The city may have had some 300,000 inhabitants at its heyday. Air - Direct flights from Lima to Jaen. From Jaen it is around 3 hours by car to Chachapoyas. Ground - Private car (around 8 hours) or overnight bus from Chiclayo (around 10 hours). Movil Tours and Excluciva operate luxury buses with lay-flat seats or executive VIP recliners. 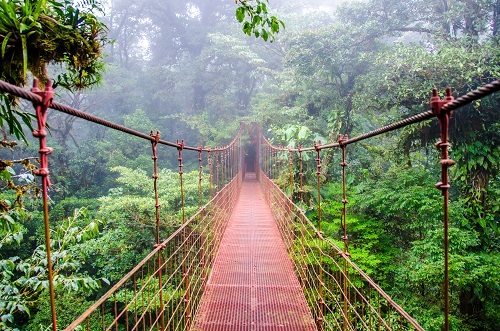 The scenic route travels via Jaen then descends and crosses the Maranon into the Amazonas region. Chachapoyas is capital of the Amazonas region and an isolated colonial town from where you base your exploration of the area. Strolling the streets you will notice people with blue eyes, light-colored skin and hair. These folks are not tourists, they are local residents and descendants of the mysterious Chachapoyan people. There is a good selection of hotels in town, from basic backpacker lodges to small 3-star hotels with plenty of local character. 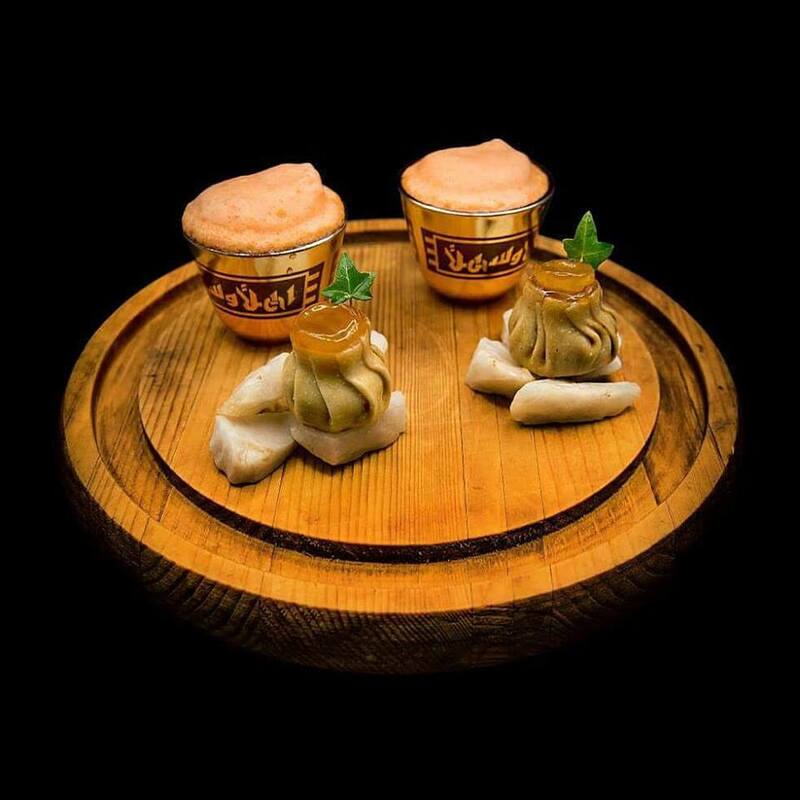 The La Xalca and Hotel Vilaya are two of the best in town. A good option is to stay at the Choctamal Marvelous Spatuletail Lodge in Choctamal, only 30 minutes from Kuelap. It has been estimated there are less than 1000 Marvelous Spatuletails in the entire world, which positions them on the Red List of endangered birds. They live only in this small area of Northern Peru on the slopes of the Andes. You can often spot them flitting about the lodge grounds. Hike to Gocta Waterfall – there has been some dispute about the claim that Gocta Waterfall is the third highest waterfall in the world. 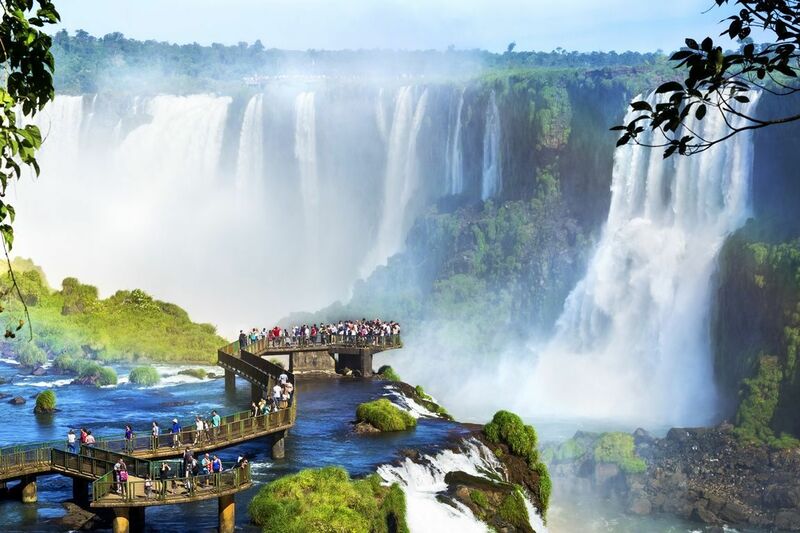 Some say it is the fifth highest and others the 14th – the latter based on the World Waterfall Database. The 2,529 foot-tall waterfall - known as La Chorrera by locals - was discovered by the German explorer Stefan Ziemendorff in 2002. When you walk close to the tallest drop it is an awesome experience as the spray blasts you. Along the approach forest trail you have a good chance of seeing the endemic yellow-tailed woolly monkey, which only exists in northeastern Peru. From the village of Cocachimba it is a 2.5-3 hour walk (each way) along a good trail to the base of the falls. The Tombs of Revash – a complex of funeral buildings and tombs from the pre-Inca civilization located on the edge of a limestone cliff at around 9,180 feet above sea level. The red and white accented structures pop from the green and grey cliffs. They appear like small houses set along the face of a cliff. The structures remain in good condition despite having been looted many years ago. In the 1980s archaeologists found skeletons here, as well as tools made from bones and musical instruments. There are 18 other smaller sites situated around the Santo Tomás Valley. Revash is located about 40 miles south of Chachapoyas. 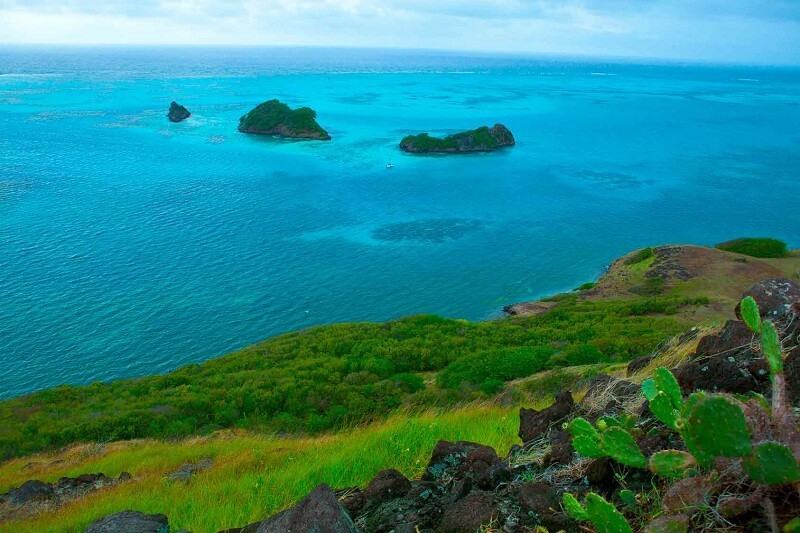 The steep hike takes at least three hours and should not be attempted without a guide. You will not be allowed to climb to the houses; however, the tombs are best photographed from below. 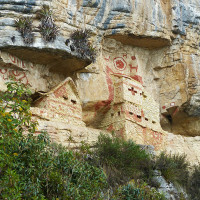 The Sarcophagi of Karajia – tombs made by the Chipuric culture, a sub-culture of the Chachapoyas culture, to house the remains of important individuals. Several of the tombs were raided and damaged long ago, but a distinct group of six statues remains. The stylized human figures with expressive faces are iconic images of the northern kingdoms. The statues are set along a narrow ledge on face of a cliff 80 feet above the path below. 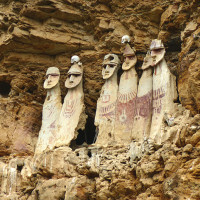 The heads have long faces that are painted in reddish hues. A few skulls rest on top, and there’s a funeral capsule contained within. Inside are human remains and offerings. The Sarcophagi of Karajia are not the only ones in the area, but they are the easiest to see and get close to. The hike to the tombs takes around 30 minutes each way and the trail can be muddy so sturdy hiking shoes or boots are recommended. Horses can be rented for those not wanting to walk. Visitors are not allowed to get up-close to the statues so it is a good idea to bring binoculars. The Mummy Museum of Leymebamba - where visitors can wander through four rooms of the museum with many of the best finds on display, including quipus (knotted strings used for accounts by the ancients) and the environmentally controlled mummy room. Go now! Direct flights between Lima and Jaen and the recent construction of a cable-car system will bring a sharp rise in the number of tourists to this area. Custom Lost World Adventures trips can be designed from 3 nights and longer. 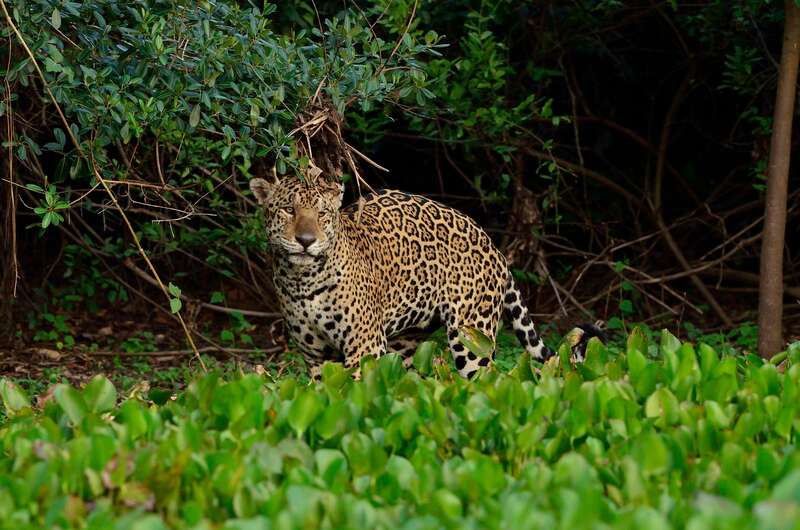 Packages with Lost World Adventures can include private round-trip car service from Chiclayo or Trujillo, domestic flights, hotel accommodations, private guided day trip to Kuelap, additional excursions. Click Free Consultation if you want to discuss a trip to the Northern Kingdoms of Peru with a Lost World Adventures consultant.